East Portland resident Sarah Iannarone during a December 2016 protest at the corner of SE 82nd and Division. 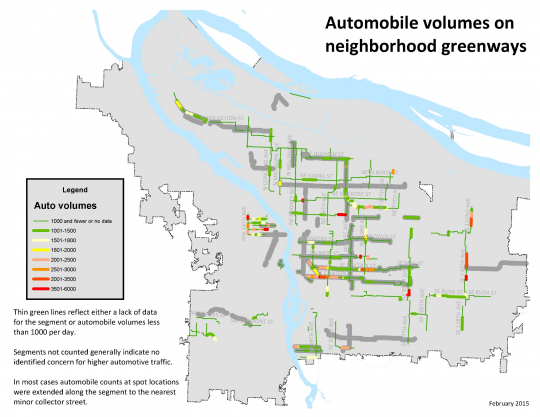 A new state law that would allow the City of Portland to reduce speed limits on over 3,000 miles of residential streets — that’s over 60 percent of all the streets in Portland — to 20 mph cleared a major hurdle yesterday. With a vote of 4-1 in the Senate Committee On Business and Transportation, House Bill 2682 now only has to pass a vote of the full Senate before it can be signed into law. 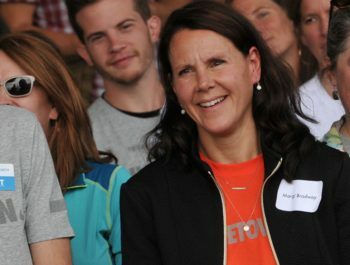 The bill passed the Oregon House 55-1 back in April. 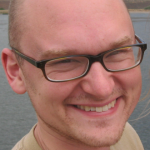 The bill, sponsored by State Respresentative Rob Nosse, would only apply to the City of Portland. 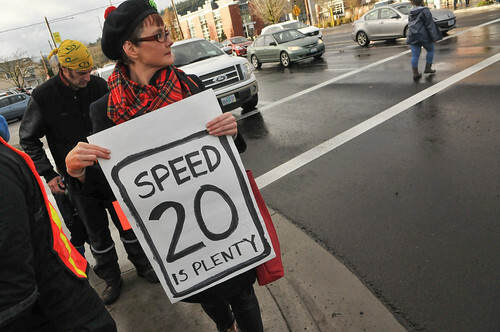 It was amended after cities and counties across the state said they didn’t want the added resonsibility of making speed limit decisions themselves and would rather have ODOT’s continued oversight. The corner of Southeast Ankeny at 15th. The Imago Dei church is on the left. After about a year on hold, proposed improvements to a much-used neighborhood greenway are back in action. City project manager Sheila Parrott will meet March 10 with the Buckman Neighborhood Association to discuss the need for speed bumps and a new traffic diverter to reduce auto speeds and volumes in inner SE Ankeny Street. 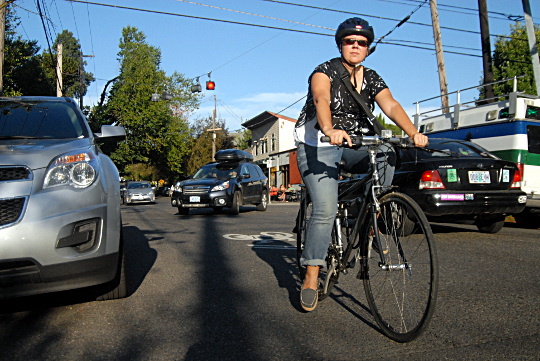 A traffic diverter allowing biking and walking traffic but blocking auto traffic. Traffic diverters: back by popular demand. The Bureau of Transportation wants to remind everyone that Portland still deserves to be Platinum. 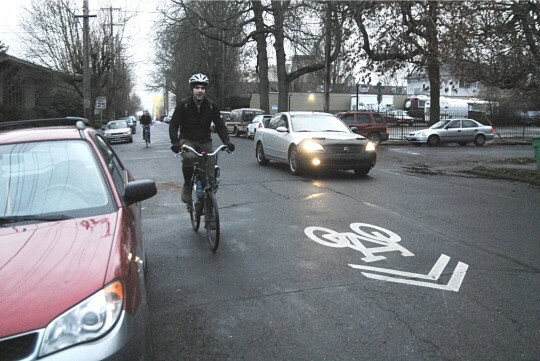 As local activist Will Vanlue continues to gain traction and headlines for his petition (it’s up to 550 signatures) to have Portland’s Platinum bicycle-friendly status downgraded by the League of American Bicyclists, PBOT has gone on the defensive. The agency has put together a seven-page document outlining their case and they reached out to us for a conference call this morning to talk about it. On the call was PBOT Bike Coordinator Roger Geller, spokesman Dylan Rivera, and Margi Bradway the manager of PBOT’s Active Transportation division. 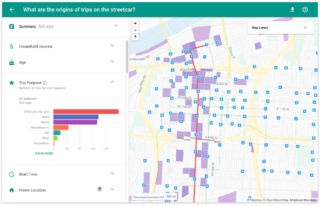 The first numbers are rolling in from the first comprehensive analysis of the country’s first connected bicycle boulevard network, and they show some clear problem spots. 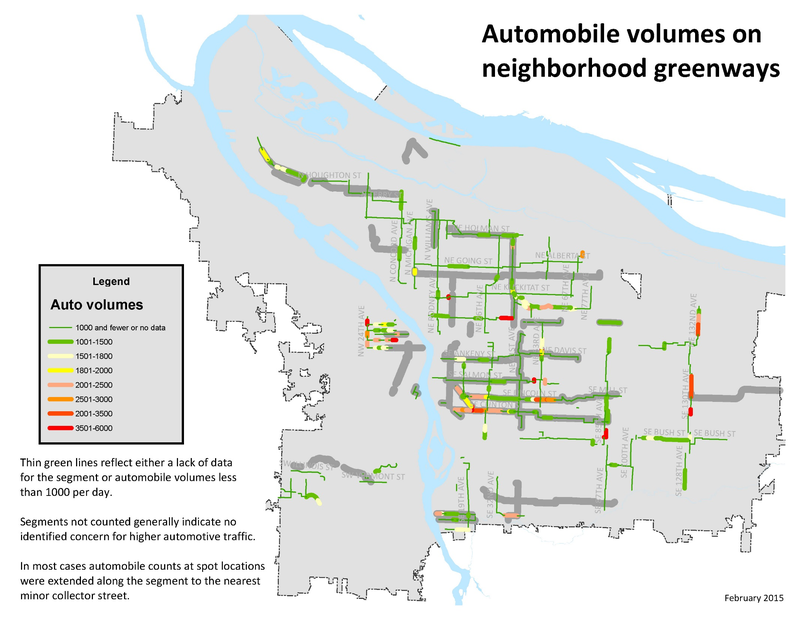 The side-street bikeways are known in Portland as neighborhood greenways to capture their appeal as places to walk, jog, shoot hoops and so on. But the City of Portland’s project shows that six — inner SE Clinton, SE Lincoln near 53rd, NE Tillamook near Grant High School, SE 86th near Powell, inner Northwest Johnson and upper NW 24th — clearly fail national standards for auto counts on bike boulevards. 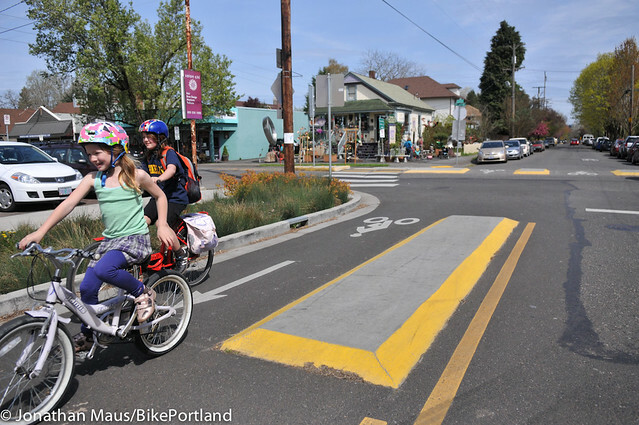 As cities from Seattle to St. Louis to Louisville work to duplicate Portland’s “neighborhood greenway” concept on their residential streets, Portland is giving its trend-setting system a closer look. 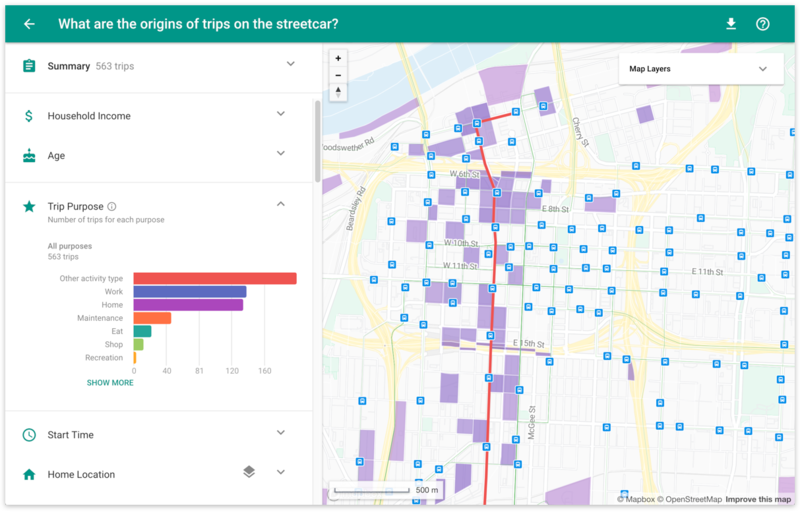 A team of experts in the city’s transportation bureau will spend part of their time in the next few months looking closely at trends in how people use the system while biking, walking and driving. A public report is due in early 2015. 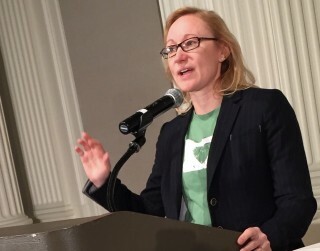 City Active Transportation Division Manager Margi Bradway said Wednesday that the goal of this report, which she predicted will receive national attention once it’s complete, is to inform an upcoming policy conversation here in Portland about how best to keep improving the greenway system.